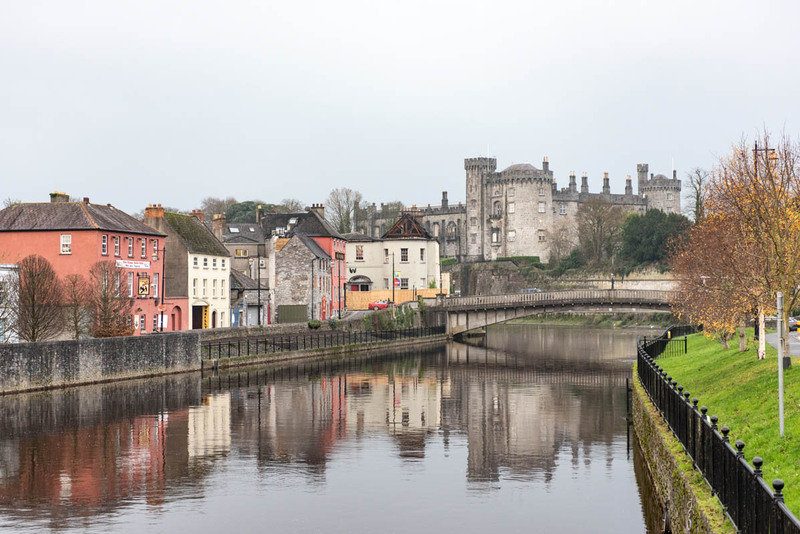 Kilkenny, Ireland's favorite medieval city - WattWhereHow? 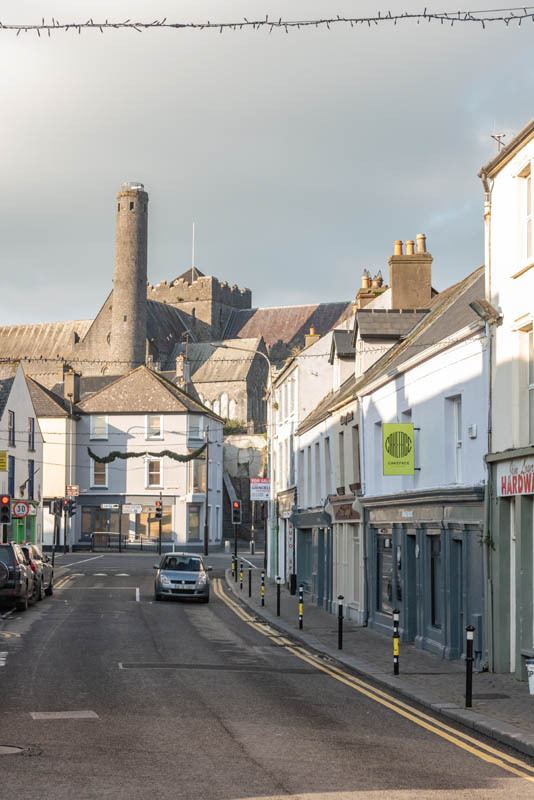 Some cities just connect with you on such a personal level that you could easily see yourself living there and Kilkenny is one of those rare gems. 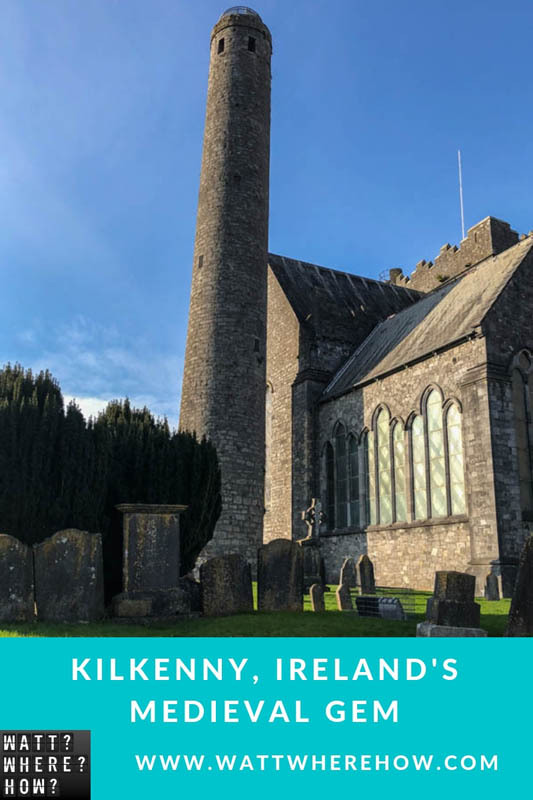 The capital of county Kilkenny is a colorful city with an equally colorful past, yet its nickname is The Marble City due to the black limestone which has veins of fossils threading through it, giving a marble-like look from a distance. 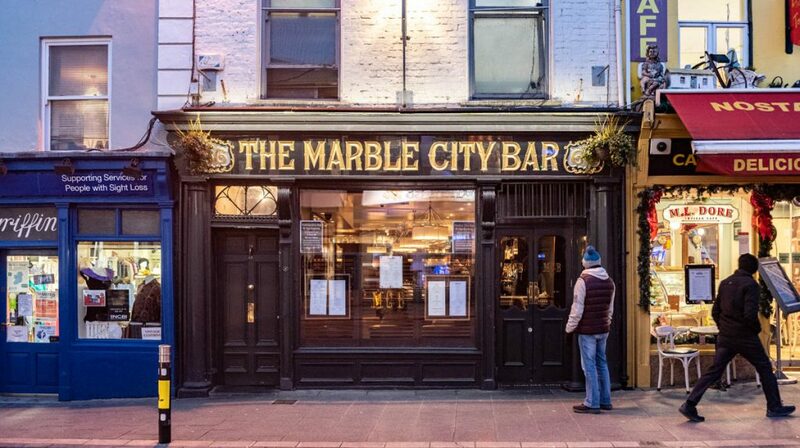 The black stone is visible in the pavers and walls of the old city, but the all that black is offset by brightly painted shopfronts and bars. 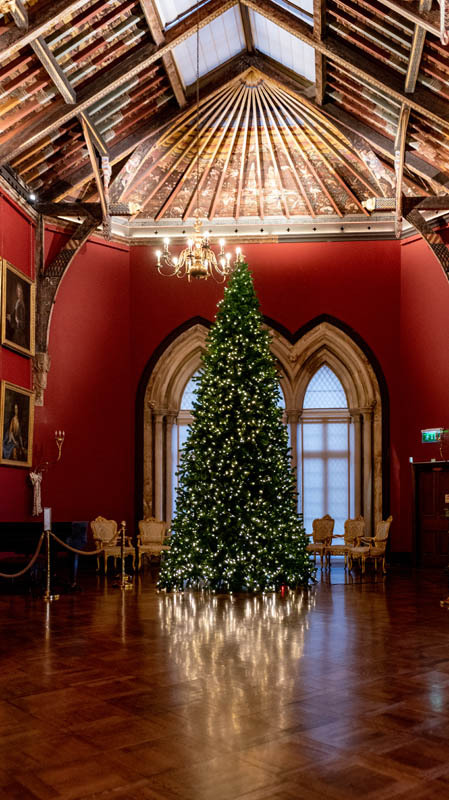 Being November, the greens and reds of Christmas decorations and a celebratory feel and a few extra hues to the pallet. 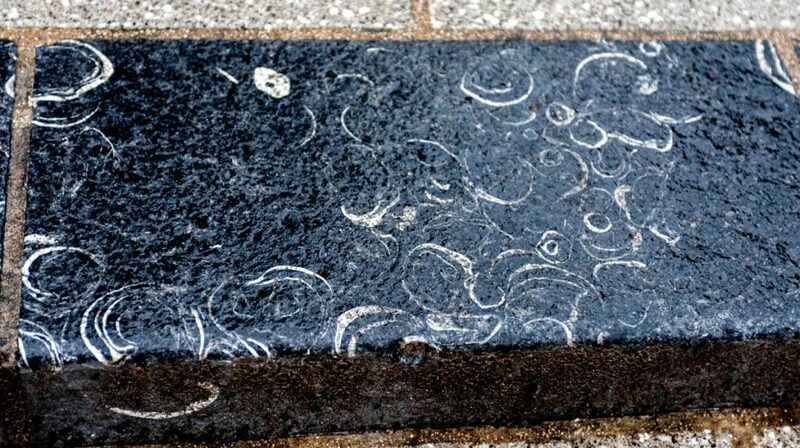 The distinct stone was mistaken in the past for marble. If you’re into history or drinking or both, you’re in for a treat. This is a town drenched in history and beer, so be ready to soak up the best of both. 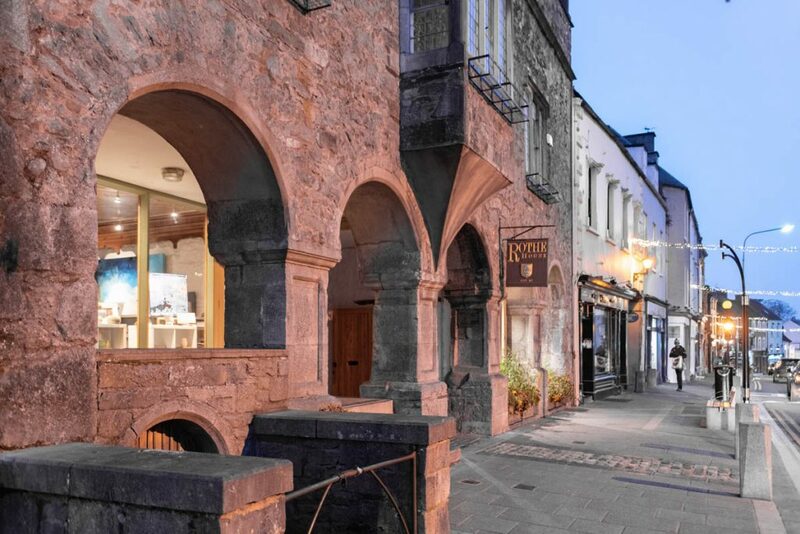 If you’re into food, Kilkenny bats well above its average with several Michelin star restaurants to discover like Campagne. 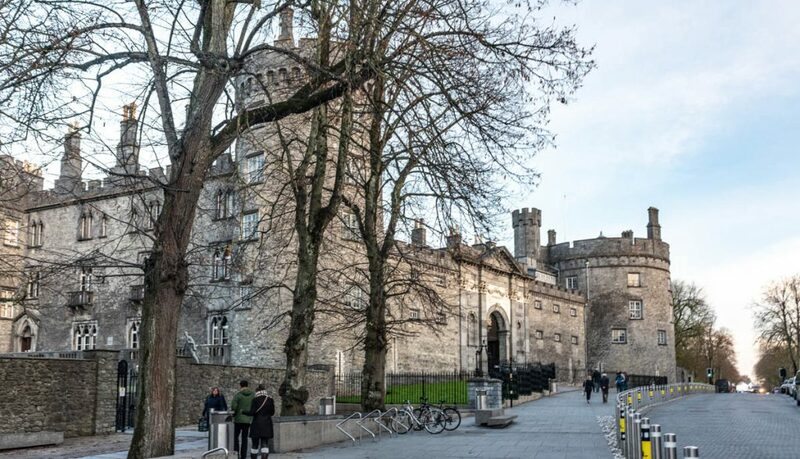 Guarded on one end by Kilkenny Castle and the cathedral of Saint Canice on the other, the area in between is known as the Medieval mile for its large collection of original buildings. 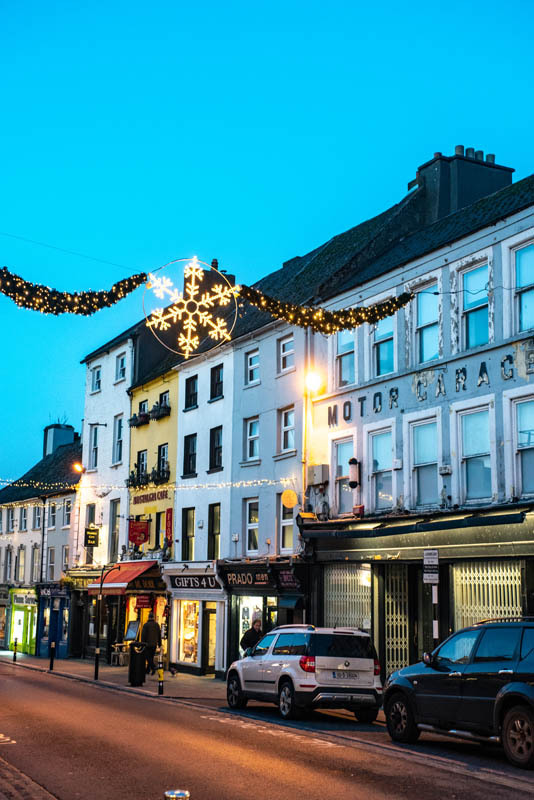 Beyond that, the city has sprawled over time, but the core attractions are to be found within this central strip. 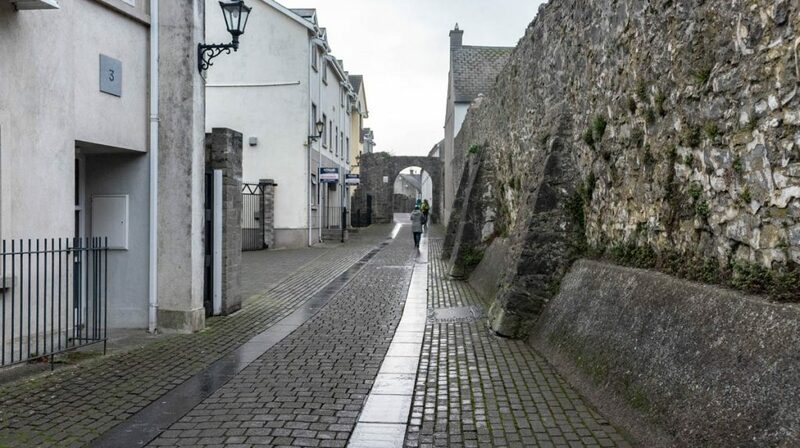 You’ll discover cute lane ways off the main street like Butter Slip. Offering an imposing facade and prime defensive position at the highest point of the city, the castle is unmissable. 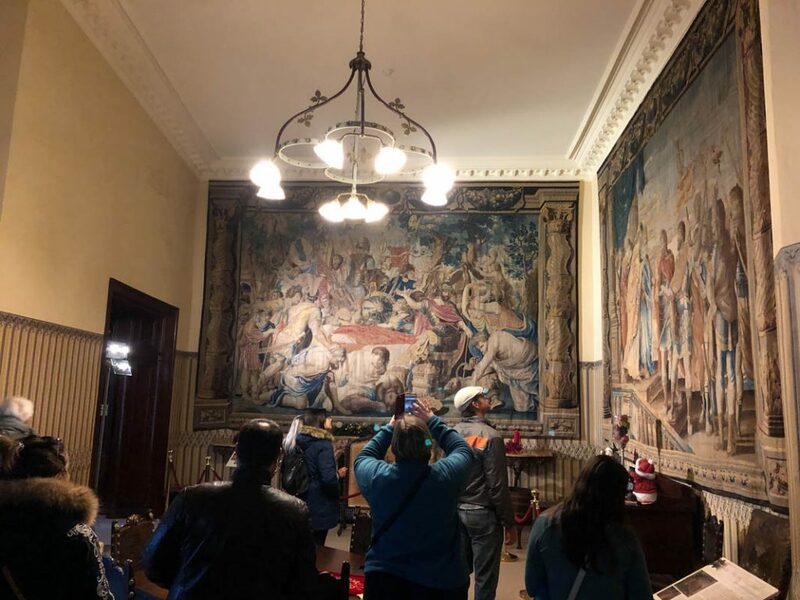 Take a guided tour through the oldest tower where archeological explorations have revealed the original wall and cross hatched branch and mud roof dating back to the early 1200s or see marvel at the art and furnishings of the 18th and 19th century. 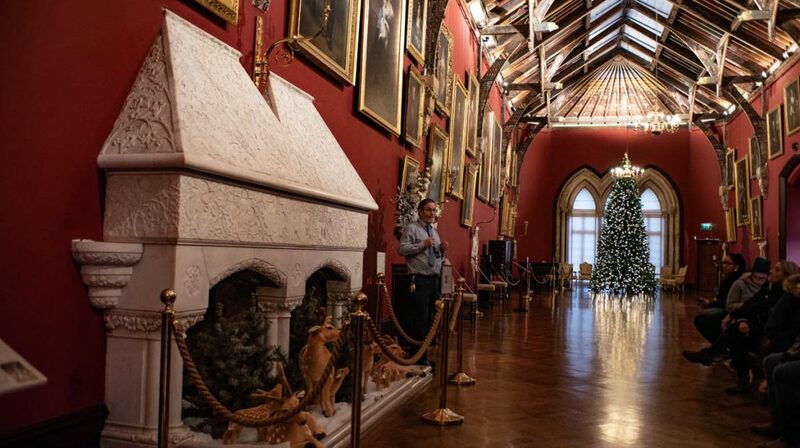 The castle and gardens offer a taste of what life was like for the landed gentry in years past and it makes an ideal starting point for your Kilkenny explorations. 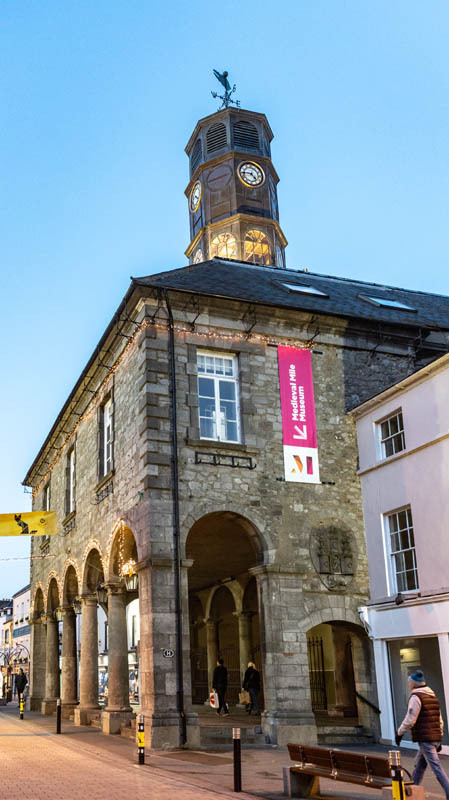 From humble beginnings, the studio is a Kilkenny powerhouse. 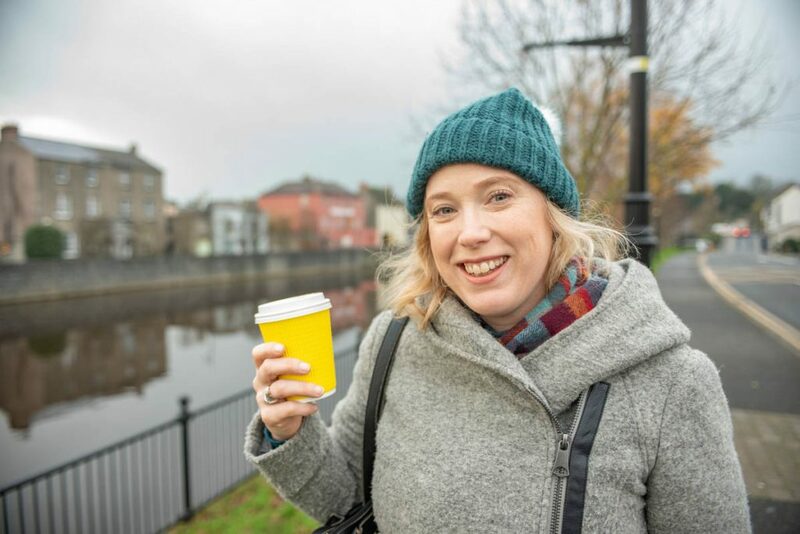 Hidden up a nondescript back street is one of Kilkenny’s best kept secrets. 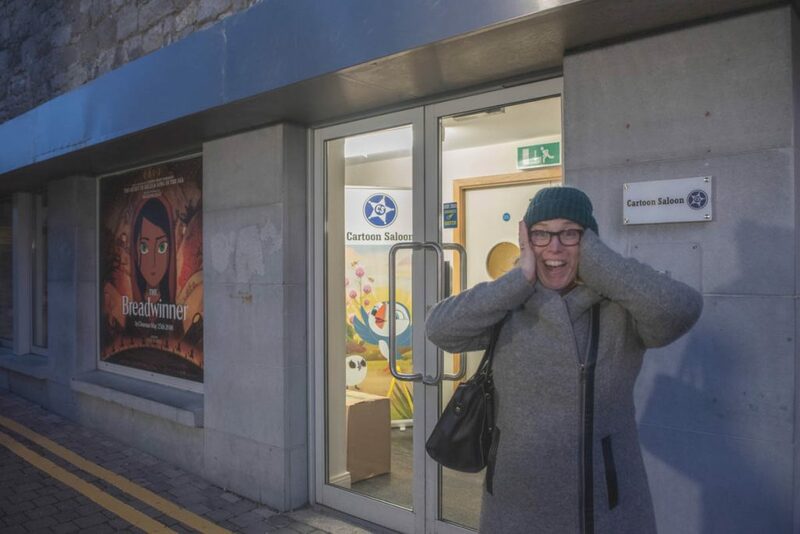 Cartoon Saloon is a modern, yet humble animation studio that has put the town on the global creative industries map. So much so that it has just signed a major deal with Apple to provide content for its yet to be named streaming service that will compete directly with Netflix, Hulu and Amazon. It’s gradual rise as a motion picture and production powerhouse started with the rich hand drawn animations of Thom Moore whose deft pencil skills brought to life Irish folk tales in vivid, stylized color. 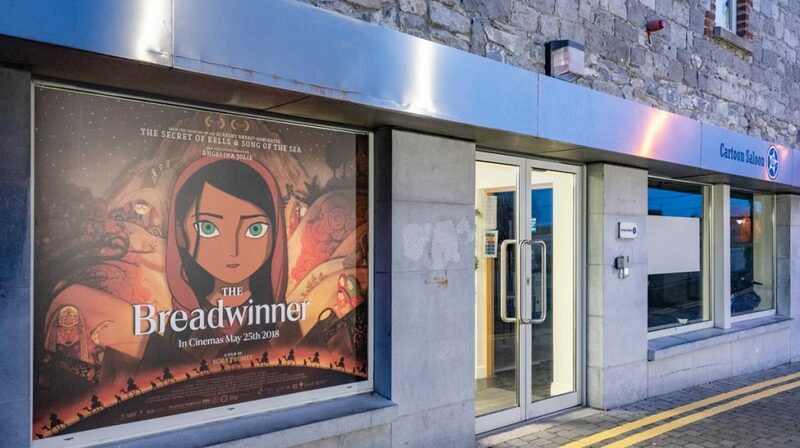 The Secret of Kells, Song of the Sea and The Bread Winner have all been recognized at major film awards including the Oscars. The studio as of now doesn’t offer tours or souvenirs but they intend to in the future. Jess is a huge fan of Cartoon Saloon animations. A little local street art. The city’s creative energy is also seen in its art scene. 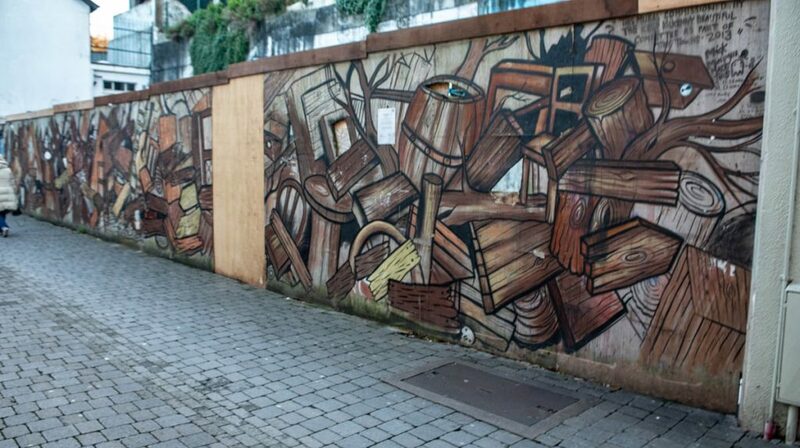 Street art is highly visible, but respectfully kept to modern hoardings and not the medieval walls. On the day we arrive, the Subtitle film festival is on and there are bohemians, students and hipsters (how do you tell the difference?) milling around in pubs that become makeshift theaters. Through the year the city hosts festivals and events for entrepreneurs and startups, books and art house cinema. 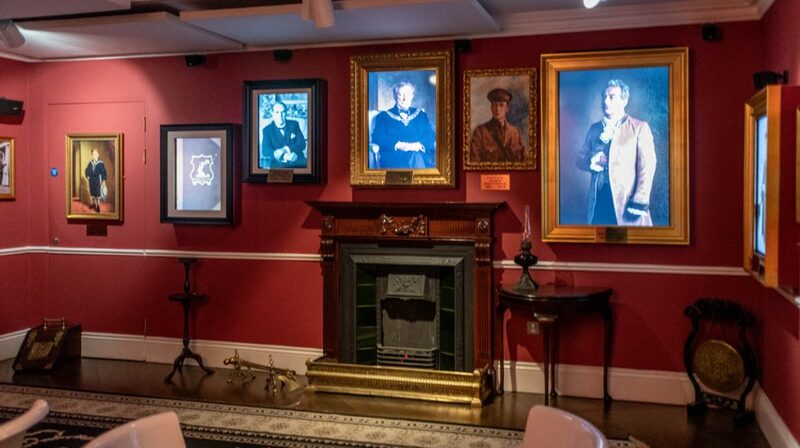 An interactive portrait gallery brings the Smithwick’s story to life. 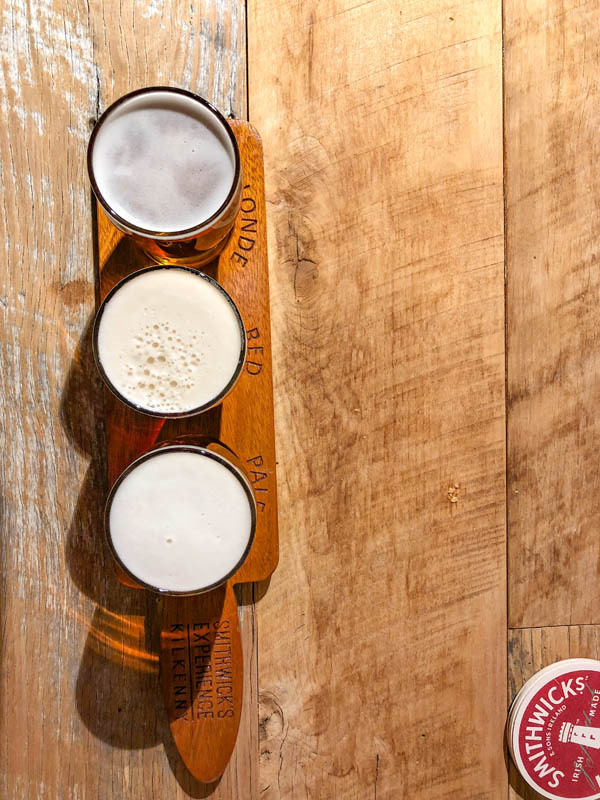 Home to both Smithwicks and Kilkenny beers, this brewery experience weaves an interesting story of the roots of both beers using state-of-the-art audio visual tricks. As the brewery stopped operating years ago, this is purely a tourist experience and a chance to sample a tasty beer. 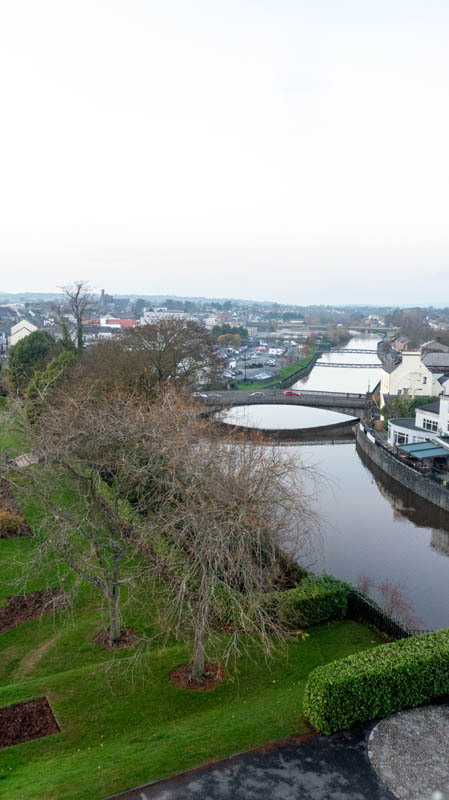 Soak in the atmosphere of the city from Kilkenny’s very own Smithwicks. 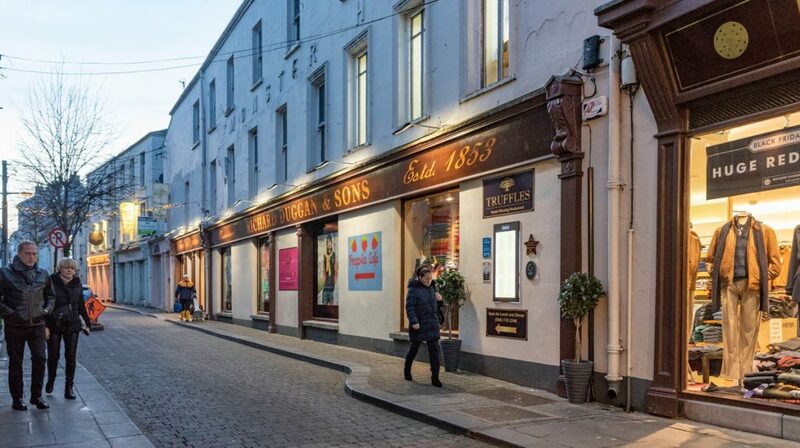 One of Ireland’s best-preserved medieval cities, it’s original wall still stands with markers on the high street showing its course. 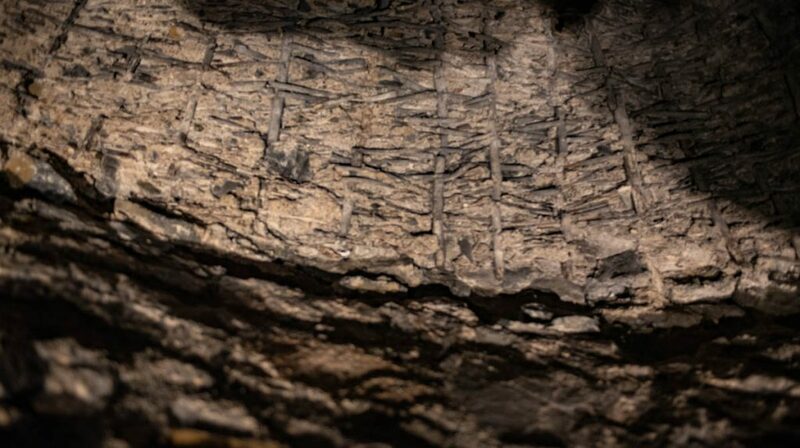 Ancient streams flow between industrial sites out into the River Nore. 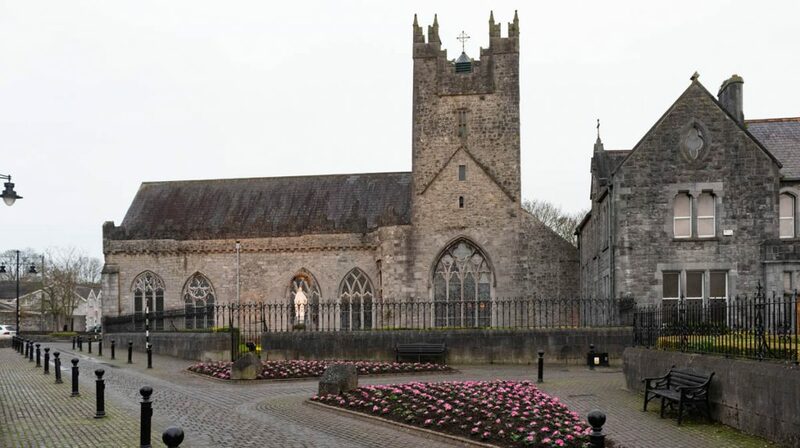 Hidden by heavy fences stands the ruins of Kilkenny Abbey, where the town’s first beer was brewed by monks. The view is obscured by building materials and barbed wire to the point that even propping a GoPro up on a monopod like a periscope can’t make it out clearly. The Black Abbey is beautifully renovated. The Dominican Black Abbey is nestled in the back streets off the medieval mile. 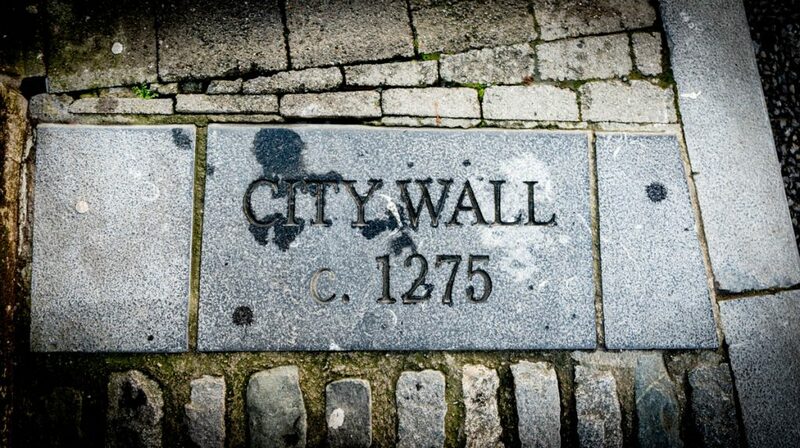 To get there, stroll up Abbey Street, where you’ll also find a large part of the old city wall. Dating back to 1225, the church was dedicated to the most holy trinity and during renovations in the 1970s, a 15th Century alabaster statue was found hidden in a wall. The former toll house is now the Town Hall. The Tholsel, the medieval Toll House is where the town’s taxes were collected. Built in 1761 by Alderman William Colles, it now serves as the city hall. 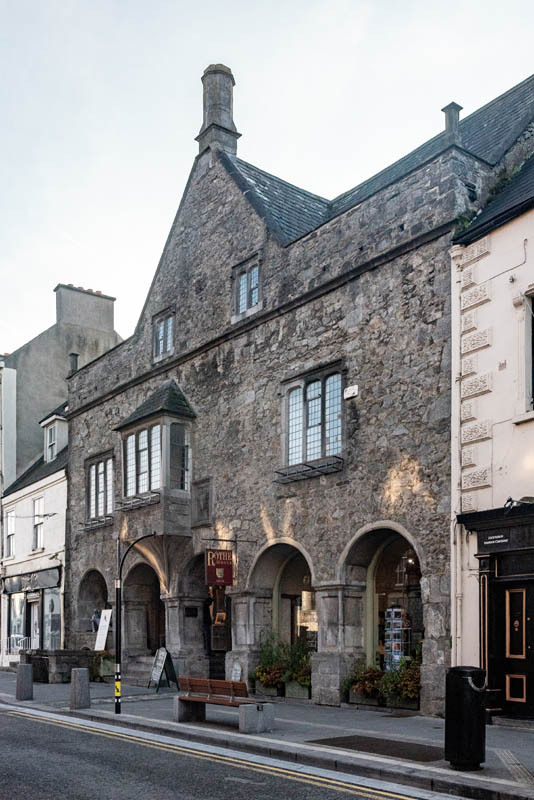 The Rothe House is a well-preserved merchant house. Today, it’s a gallery and museum with a courtyard garden behind. In summer, this would be a beautiful escape from the main thoroughfare. Behind the Rothe House is a hidden garden. The Courthouse is strategically located next to a brewery. Coincidence? 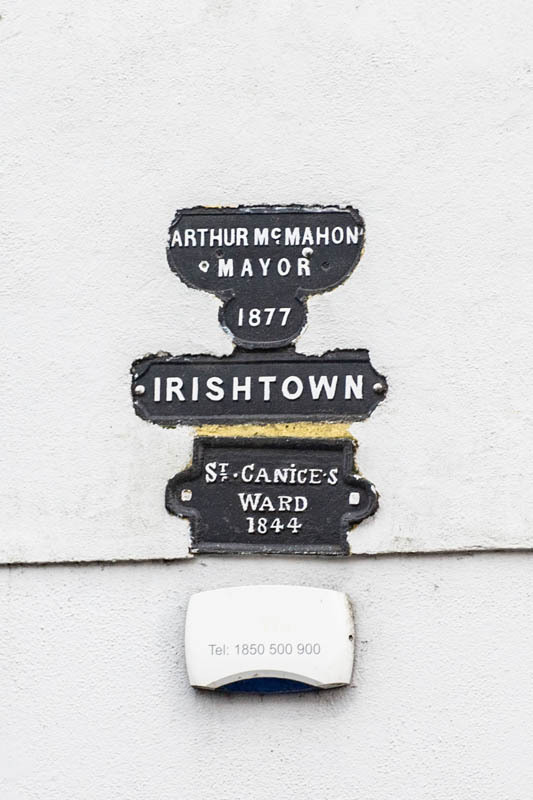 Built in 1566, the Old Jail and Courthouse sits awkwardly close to the Smithwicks Brewery – right next door. 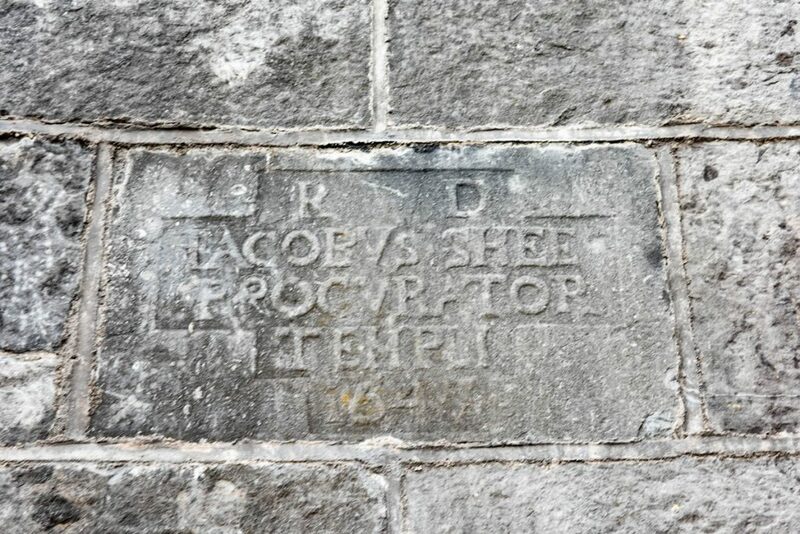 In the 1700s, it became the town court house. It is still operating as the courthouse today, with a modern entrance accessible from the side street. 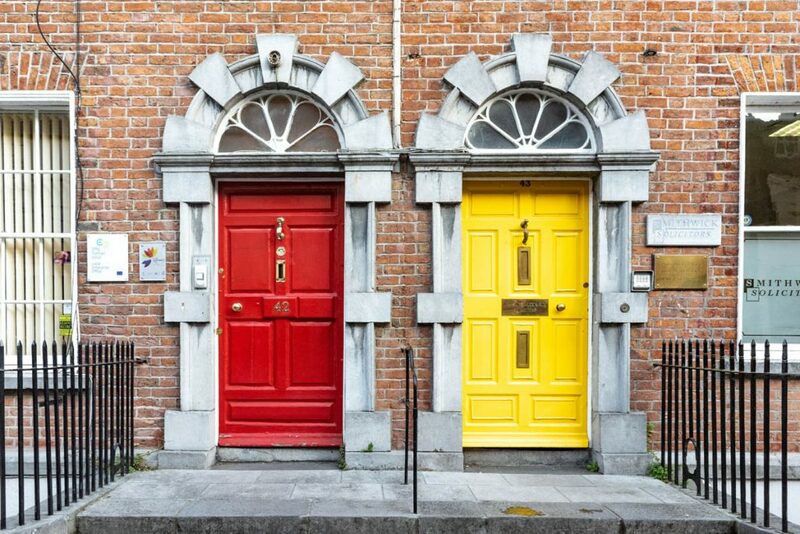 Colorful doors in the neighboring properties bear the name of law firms, showing that crime still pays. Colorful doors near the Court House. Stroll along the river from the market area and you’ll get a beautiful view of the town and castle. 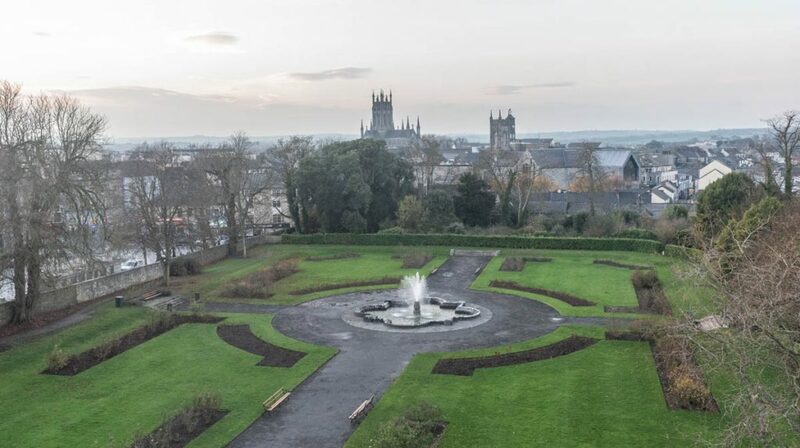 Set just below the castle’s defensive mound at Canal Square at John’s Bridge, the newest addition to the city’s landscape is a statue celebrating the sport of hurling, a competitive pursuit that dates back 3000 years. It sits somewhere between hockey and lacrosse, with two teams wielding paddles that look like oars. 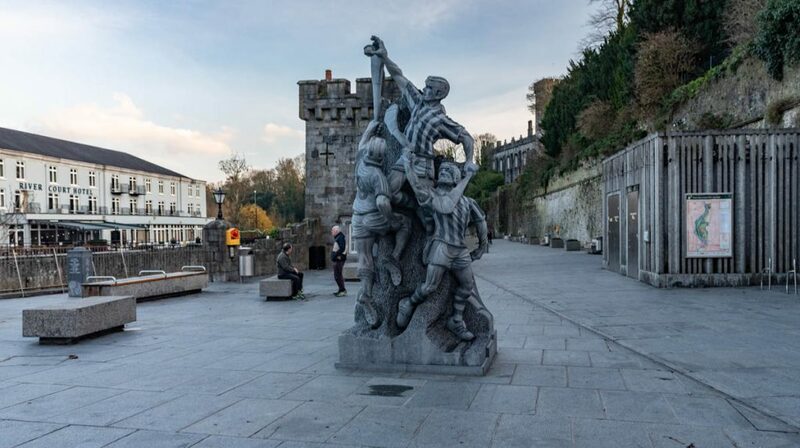 Crafted by Barry Wrafter, the monument features three hurlers reaching for a sliotar (the ball). Hurling, we found out, was not the outcome of an Irish drinking game. 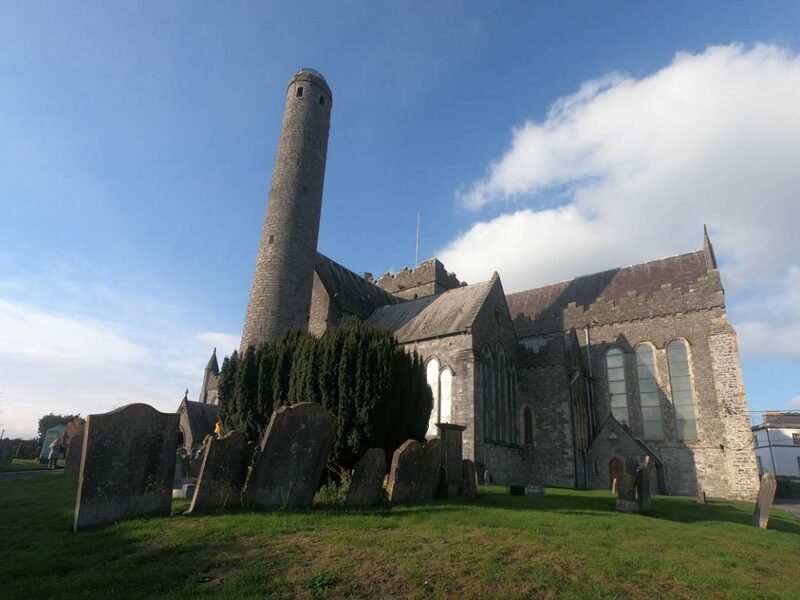 St. Canice and its medieval round tower. 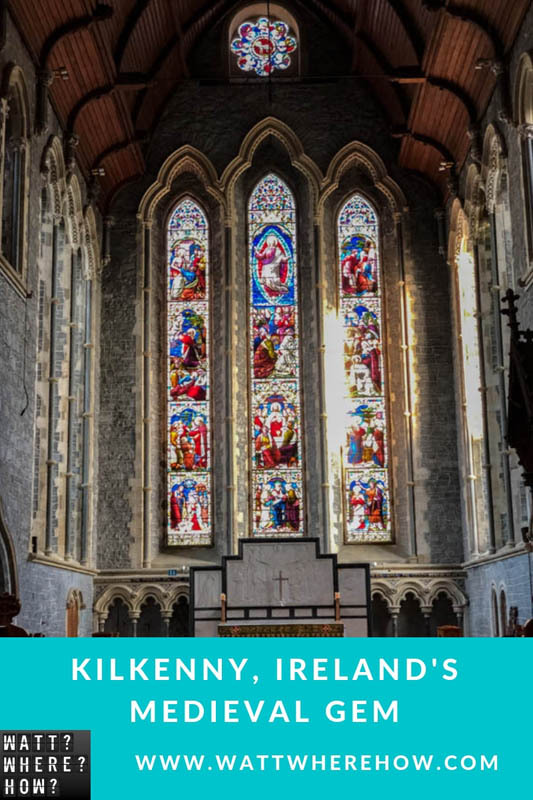 St. Canice’s cathedral, also known as Kilkenny Cathedral dates back to the 13th century on the site of a monastery dedicated to St. Canice that stood in the 6th century. 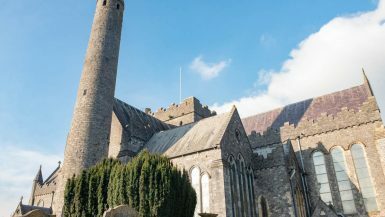 The English Gothic architecture is from around the 16th century though the round tower predates the rest of the church, a relic of the 9th century. It is one of three Celtic towers still in a condition that can be climbed. 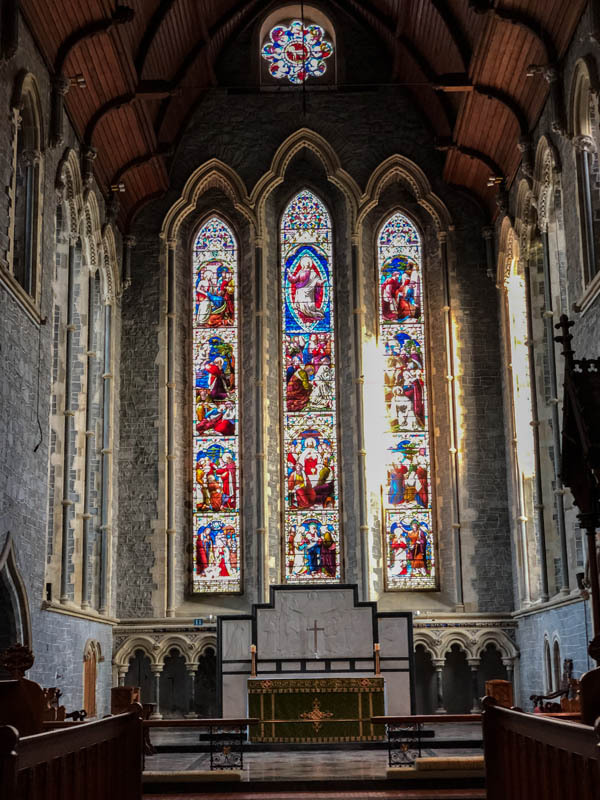 The magnificent stained glass windows at St. Canice’s. Kilkenny of late autumn is a shadow of its peak season self. 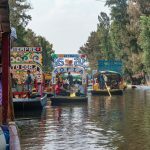 There’s barely a tourist to be seen meaning it’s a very authentic experience. Sadly, that means no live music on a Thursday night is to be found anywhere. our search for the traditional fiddle and accordion jam only led us on a wild goose chase or what we like to call a pub crawl. A theater and bar in one. 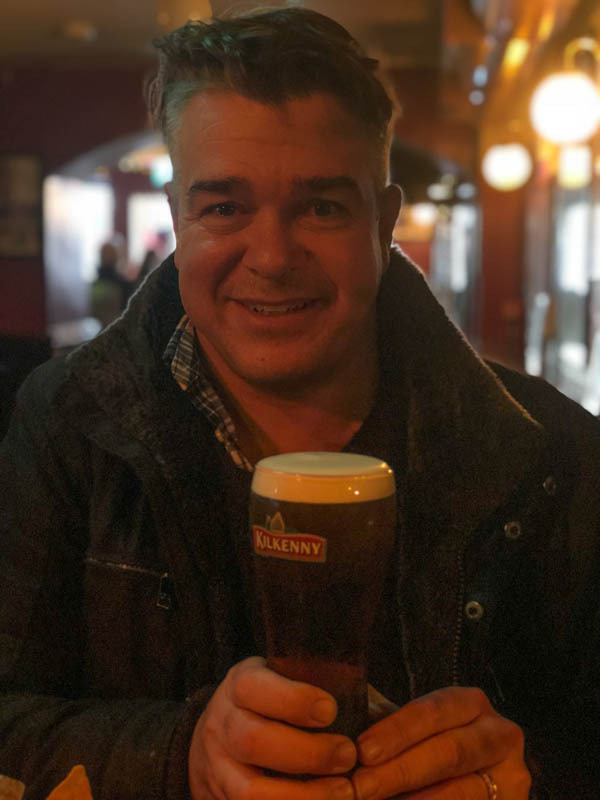 Our first stop and essential bucket list item, having a pint of Kilkenny in Kilkenny is achieved at Cleere’s Bar. From outside, its colorful red entry provides a warm welcome and that warmth is shared within. The patrons and staff are friendly, and the place is buzzing. 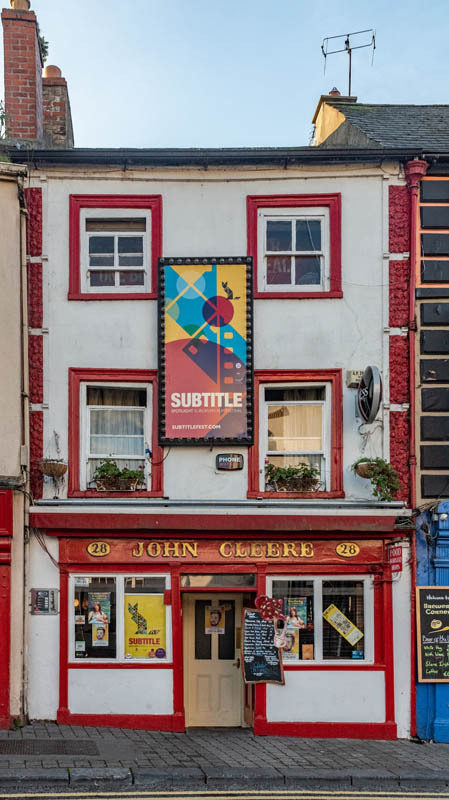 We’ve arrived during the Subtitlefest, a festival of European film and the lunch crowd mixes with the auteurs gathering around the entrance to the bar’s little theatre. 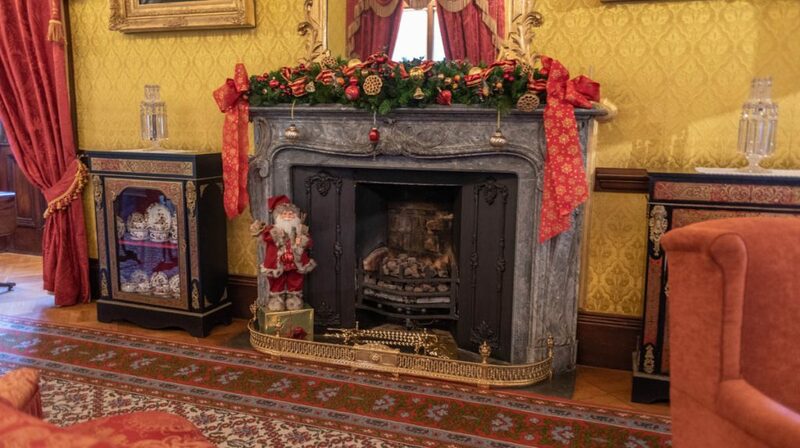 28 Parliament St, Gardens, Kilkenny, open daily from 12pm to 11:30pm. Achievement Unlocked: A pint of Kilkenny in Kilkenny. 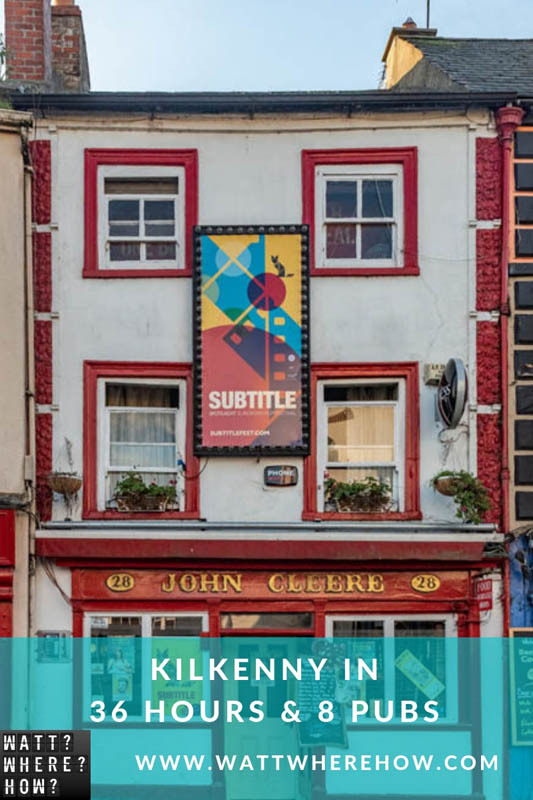 One of the oldest and most popular bars (and hence very tourist focused) in all of Ireland, Kytelers Inn is a pub with a deep, dark past that doesn’t quite gel with its renovated interior. 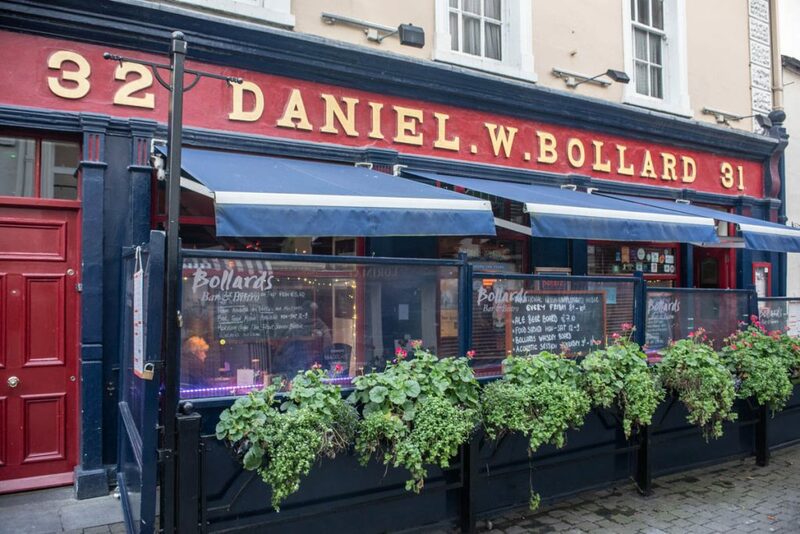 Ireland’s longest serving watering hole was first established in 1324. 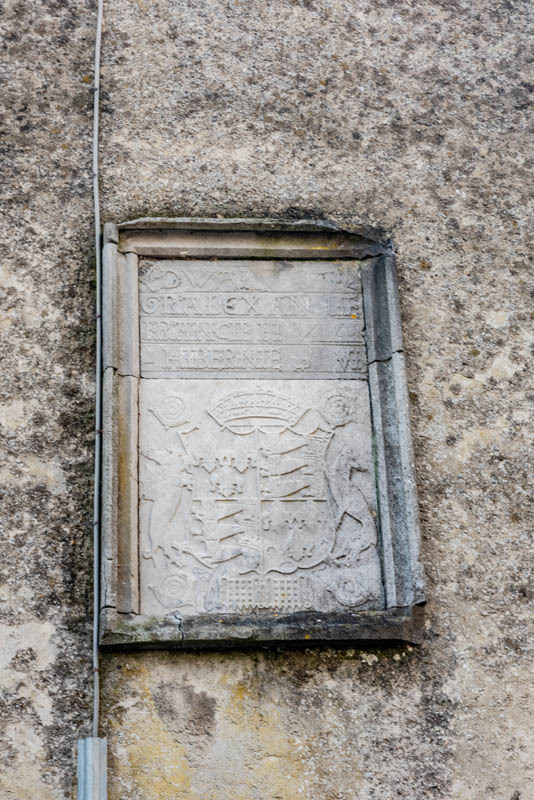 Dame Alice de Kyteler, the daughter of a Norman banker, married into wealth not once, but four times and used her fortune to build the Inn. Whether it was the bad name she earned being a pub owner or bad blood from friends of the exes she left in her wake, the townspeople. She now haunts the bar, though really the only spirits you’re likely to encounter are over the other side of the bar. 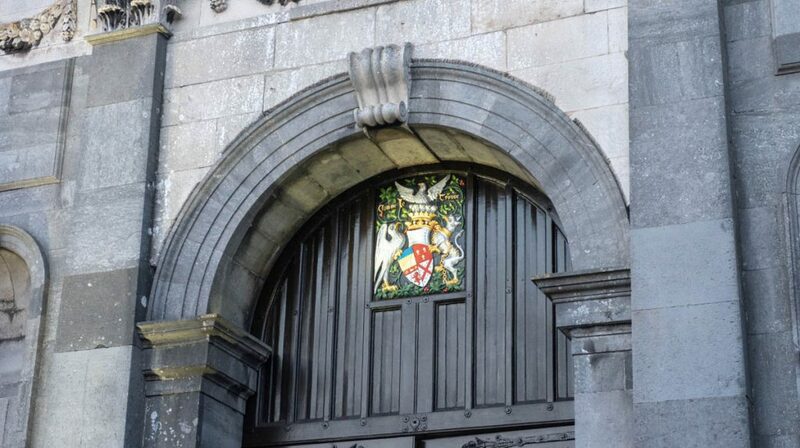 St Kieran’s St, Gardens, Kilkenny, open daily 10:30am to 11:30pm and later on weekends. 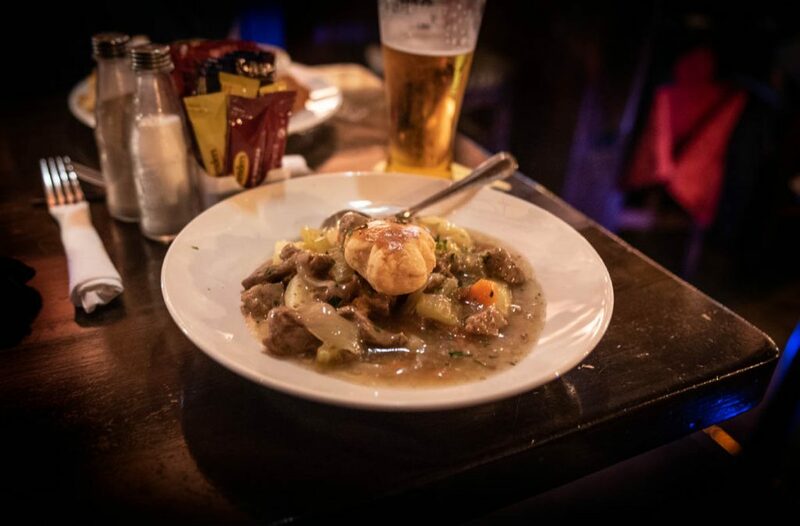 Keeping it traditional with Irish Stew. 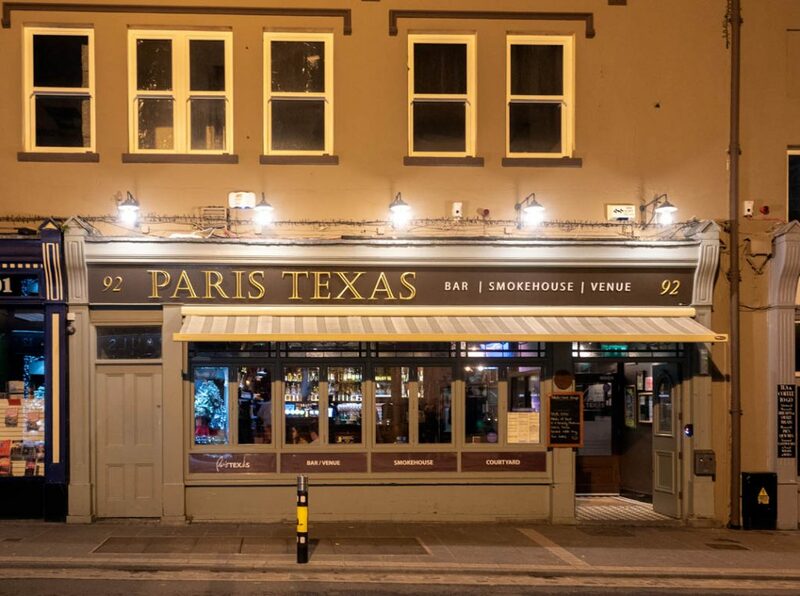 Possibly the most current bar in town, Paris, Texas is the kind of place up with the latest artisanal gin, crafted brew or Tex-Mex inspired small plate. For all its sizzling fajitas and smokehouse flavors, you can still get hearty local dishes of salmon or lamb. 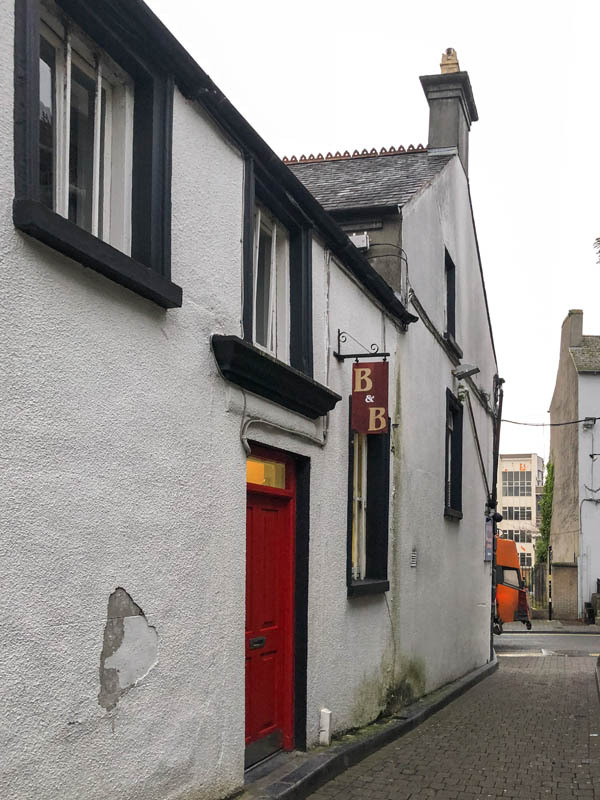 In summer it’s a popular music venue with local folk performers belting out shanty’s on mandolin and accordion but like the rest of the town, it’s almost devoid of patrons in the off season. 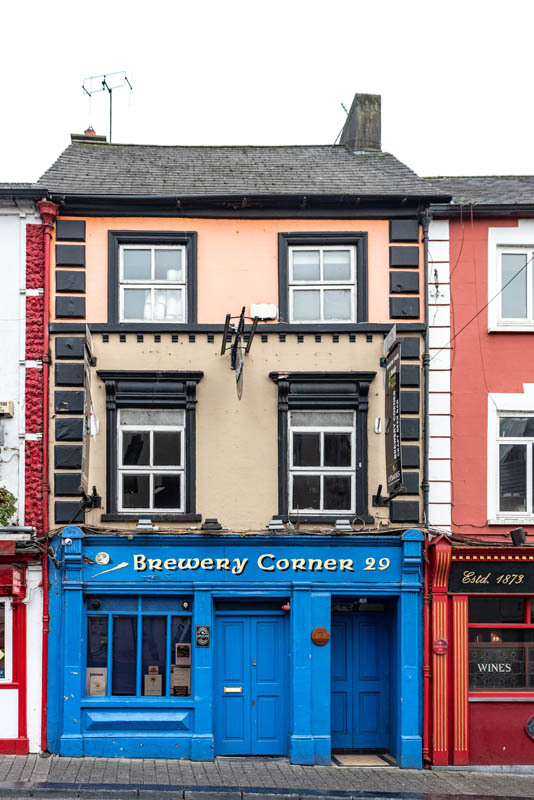 92 High St, Collegepark, Kilkenny, open daily from 12pm to 11:30pm. Bar and B&B in one. 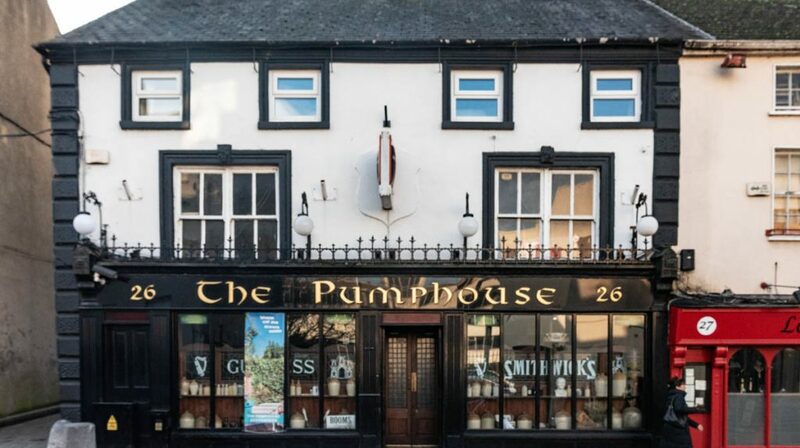 The Pumphouse fireplace casts warm orange hues around the otherwise darkened main room, a neon glow emitted from the luminescent drought taps. 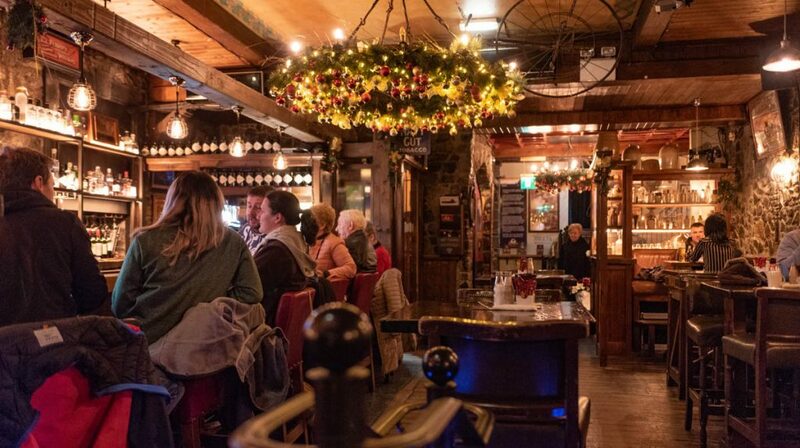 As traditional a pub as you’ll find, we don’t get the full energy of the bar as the town takes an early call to escape the icy breezes outside. 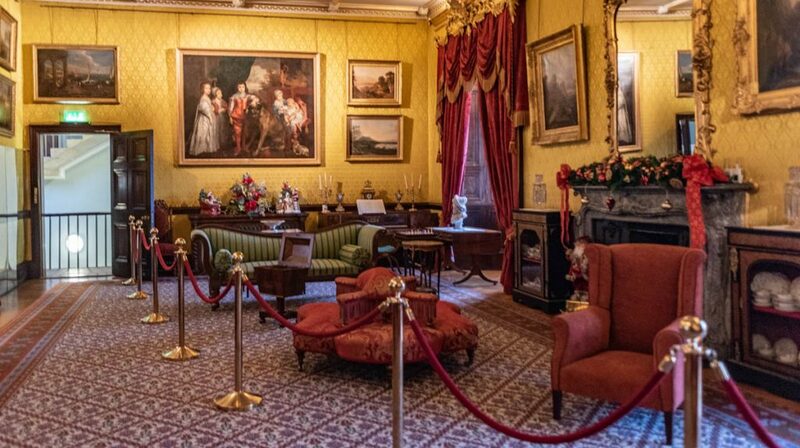 Luckily we only have to stumble upstairs where rooms can be booked via AirBNB. 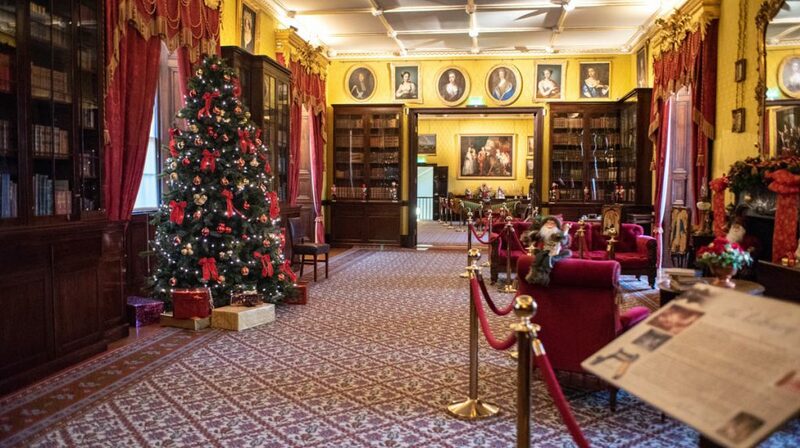 26 Parliament St, Gardens, Kilkenny, opens 12:30pm to 11:30pm daily. 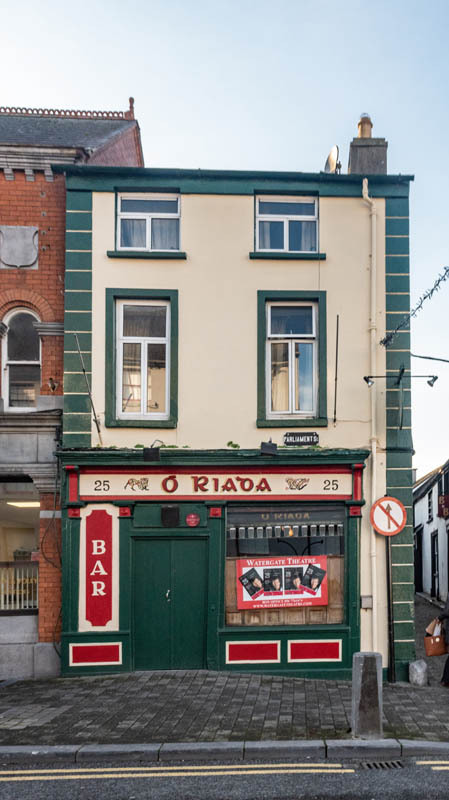 One of Ireland’s oldest original public houses, the Hole in the Wall is home to a hip little bar with thick slabs of weathered wood and quirky ephemera. 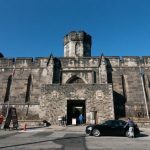 Touted as a must-visit by many, it’s hosting a gaming event and it’s a little too intimidating to go further than the door for a quick look. 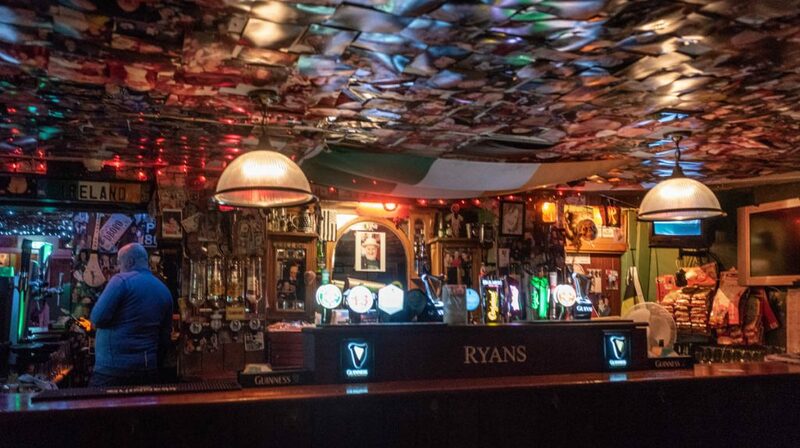 17 High Street, Kilkenny, Ireland, open daily from 1pm to 11:30pm. For all of Kyteler’s gentrified homogenization, Ryan’s offers the gritty authenticity of a genuine local’s bar. Thousands of photos are stuck to the roof (we’re not even going to start to contemplate how) and the light is minimal – you can’t see what you’re standing on, but it’s sure to be spilt beers and tears. 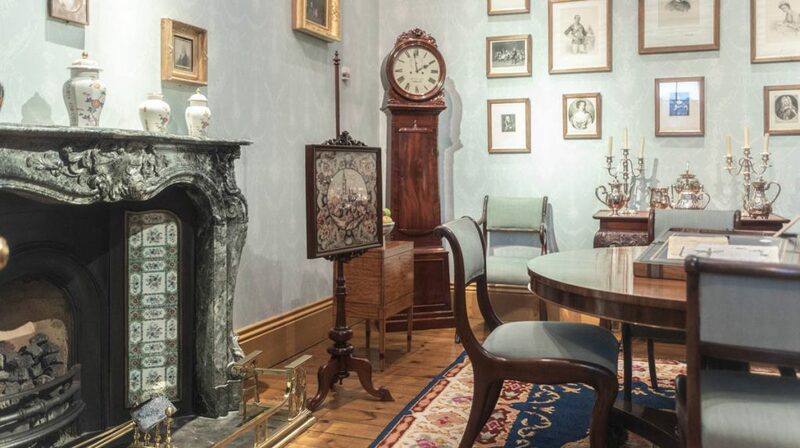 3 Friary St, Gardens, Kilkenny, open daily from 3 to 11:30pm. 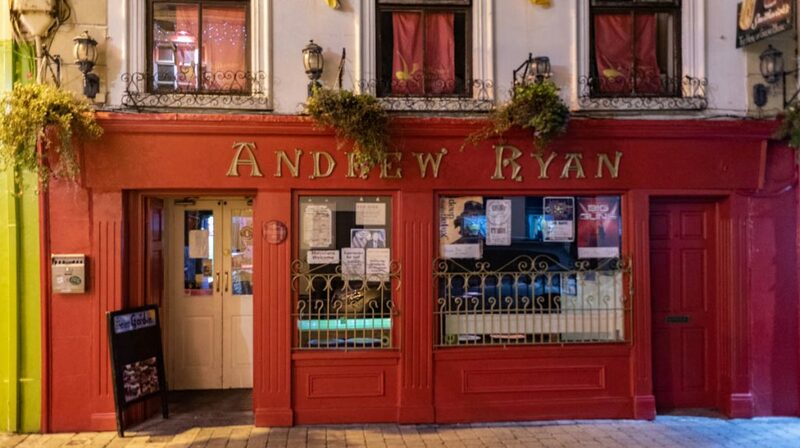 It doesn’t get much more Irish pub than this. Classic concert tickets at the Yard Cafe. 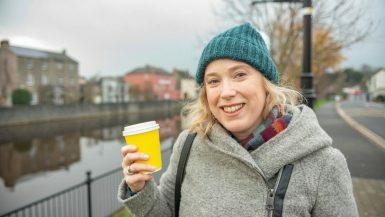 Cute as heck, with strong coffees, Kilkenny’s Yard Café is a hip little coffee shop that makes you feel right at home. The café serves organic espressos and organic and vegan foods. 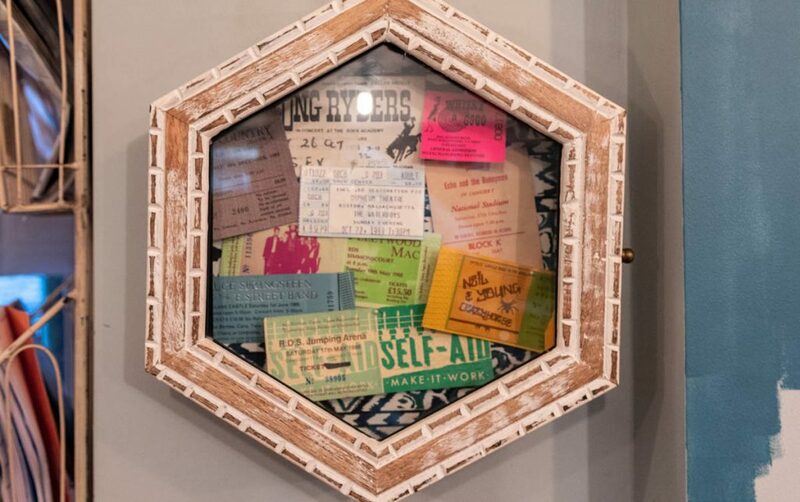 Scattered around the cozy cushioned corners and kitschy nooks, are framed gig tickets dating back to the late 80s and early 90s. The person who owned this cafe is obviously quirky—Morrissey, Fleetwood Mac, Pixies—very much in line with our own musical tastes. 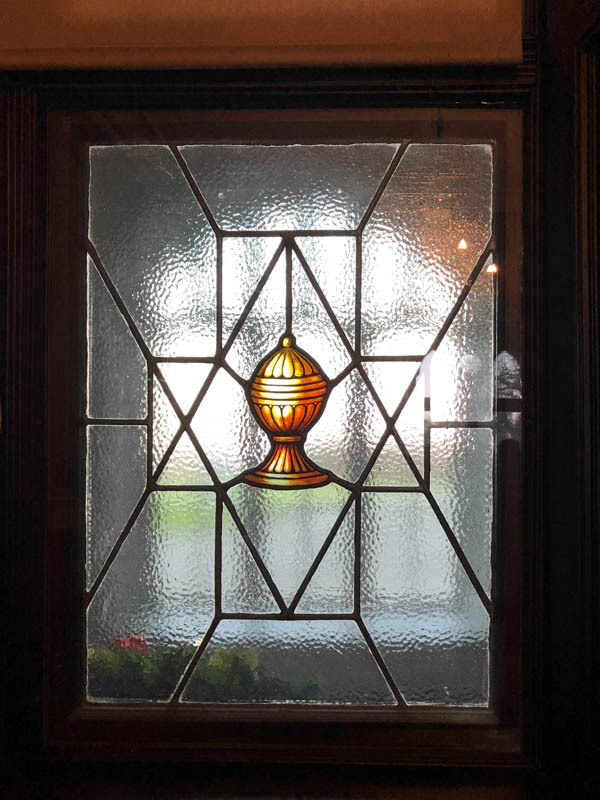 27 St Kieran’s St, Gardens, Kilkenny, R95 WRR4, Ireland. Open 8:30am to 6pm daily. 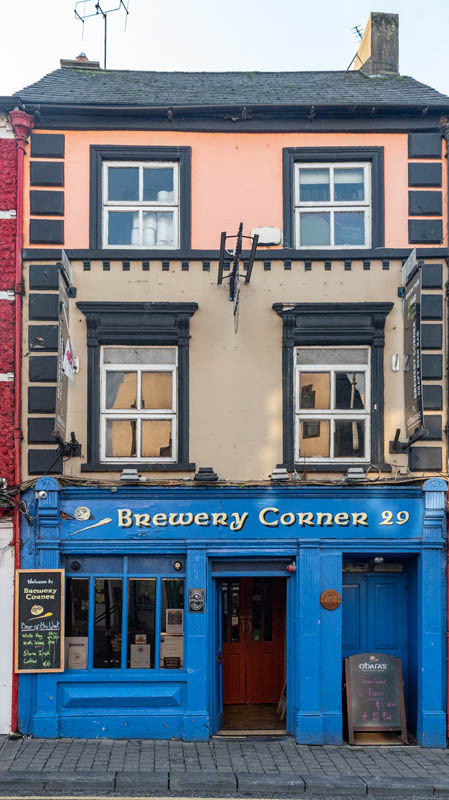 What’s a trip to Ireland without a traditional B and B pub stay? The Pump House on High Street is just that. It’s no premier hotel but it’s ten times better than backpacking. 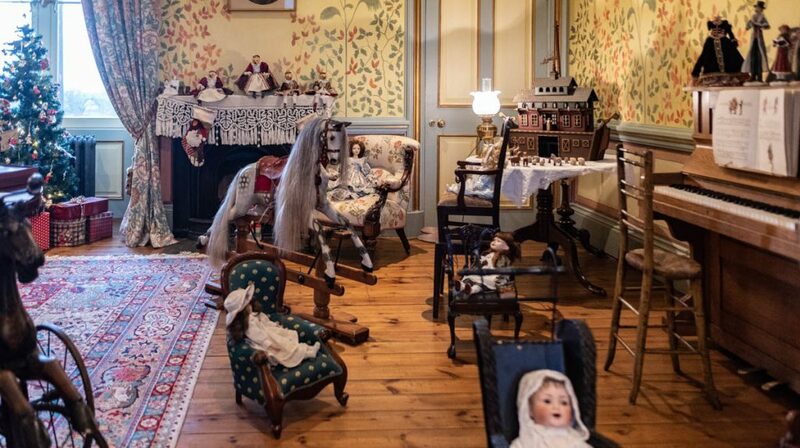 Situated up rickety, uneven stairs accessed from the cobblestone alley adjacent, every step squeaks and there are delightfully ancient pieces like a rocking horse that add a touch that could come across as quaint or just a little ghostly. Our accommodation was accessible through the bar or this cute lane. The room is small but comfortable. No closets, but free Wi-Fi. There’s a shared bathroom which wasn’t really a problem and the water was always hot and came out with good pressure. We even made use of its prime position with a few pints as a night cap. Was it a wise decision? Well we slept better than we woke up. 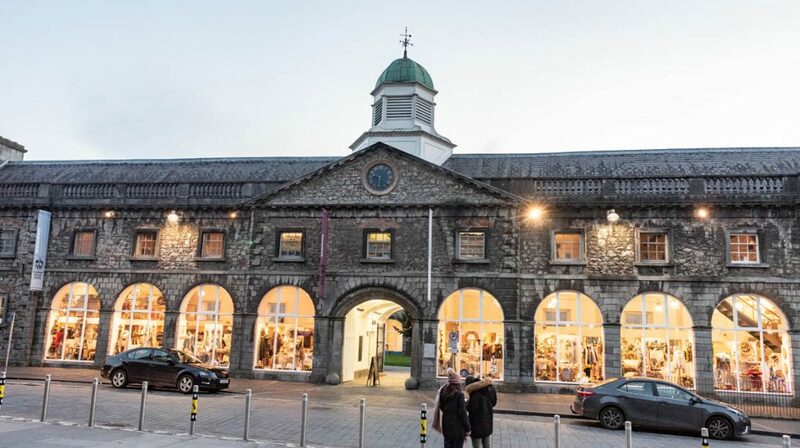 Kilkenny is only an hour and a half from Dublin by train from Heusten station. There is also a cheaper direct bus operated by Bus Eirrann. 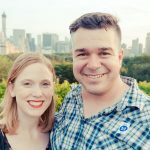 We came via hire car and there is plenty of paid parking but beware of metering rules and expiration times to avoid unwanted fines and awkward disputes with car rental companies. 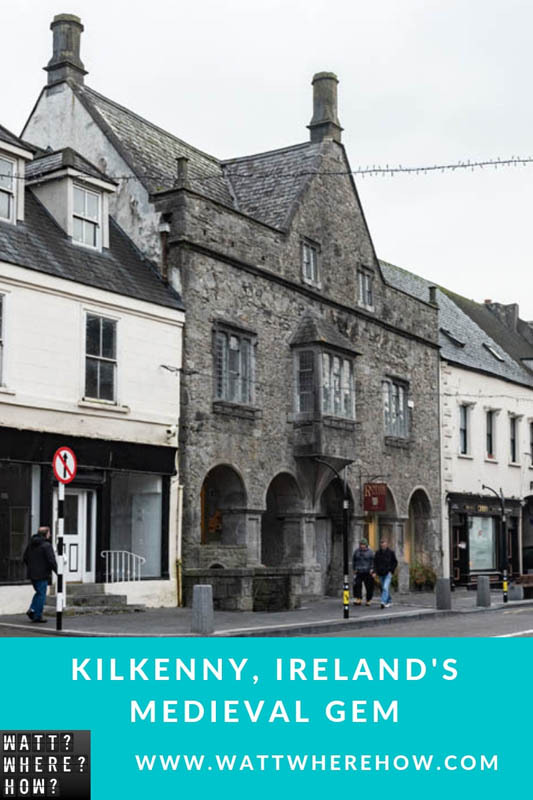 Wanderlusting about Kilkenny? Pin or share it! Thanks again. Defs check out their movies. They are gorgeous.